Despite the 85 degree temperatures (wasn't it only 77 the last week of August? 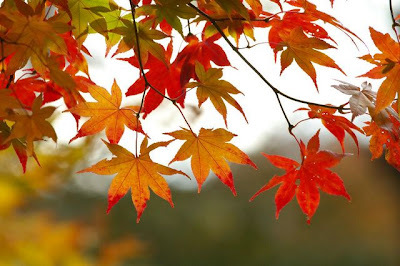 ), today is the first day of Fall! I used to love Fall far more than any other season. As I've gotten older I've grown more appreciative and grateful for the joys of every season. Fall is still my favorite by a slight margin, but Fall has also come to mean the beginning of what can be a frantic race to January 2. I used to tell Mr. T&C that I felt like I had stepped onto a roller coaster sometime in October and listened to the click, click, click of the coaster's ascent until Halloween when the coaster tipped forward and began its giddy, full speed ahead, exhilarating and slightly nauseating descent to Christmas. Older and wiser, I now hear the clicking begin around Labor Day. And this week, it's begun to grow louder. For one thing, Mr. T&C and I will celebrate our 15th wedding anniversary! On Friday houseguests arrive from Florida to go to the Clemson game on Saturday. They will leave on Sunday, and more houseguests from Maine will arrive on Tuesday. Then, on Wednesday I have a little surprise that I will blog about later. Thursday is the day the corporate merchandiser arrives to re-merchandise our store, Go Fish, and Friday is another surprise we've planned. Then Saturday, we will attend an American Institute of Architects conference Design Awards event, and then it's only a week until Mr. T&C's birthday, and then we leave for New York. Click, click, click. So, I'm thinking about handbags. Mr. T&C gave me a gorgeous Bosom Buddy bag for Mother's Day. It is not identical to the one pictured here, but it is very similar. Mine has a wide black grosgrain ribbon with a tortoise shell buckle. I have carried it everyday this summer, and I have received lots of compliments. I really hate to put it away, but it's time. And I have nothing comparable for fall. I would love to find something as simple and elegant--and I would love to find it at TJMaxx! In the meantime, I will have fun looking at what I think might work. 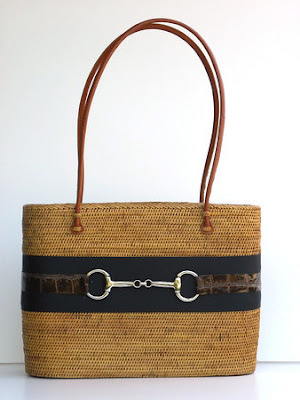 I love all the cute bags I see, big and colorful and textured, but in my heart of hearts, I know I need a structured neutral bag that just plain works. It's what suits me.